The Denver MC-5220 Black is a compact, wall mountable, CD micro system with FM radio and clock alarm that also has battery backup. 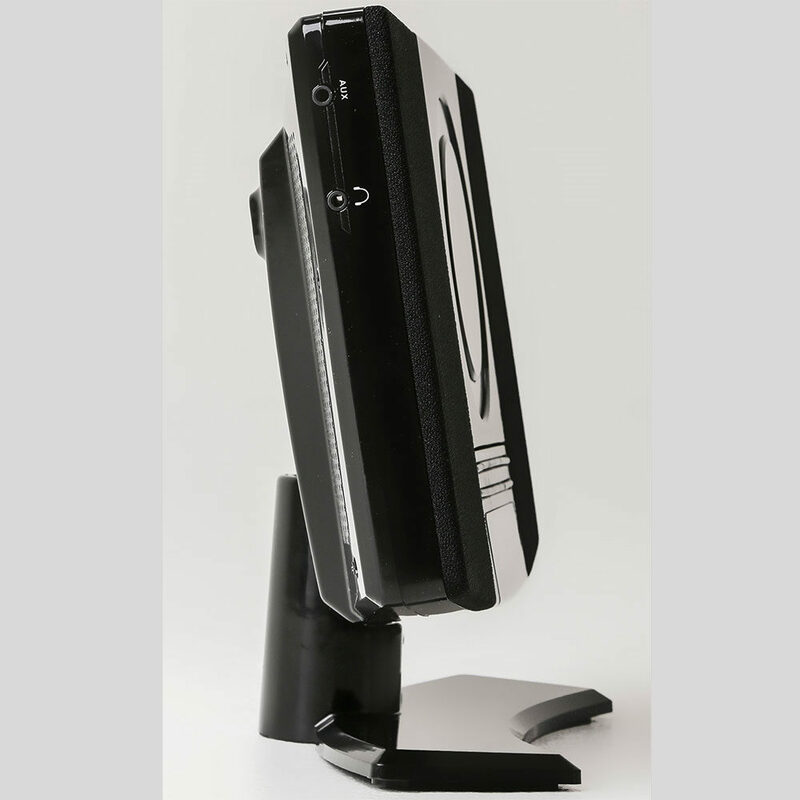 The MC-5220 also includes a desktop stand as well as being wall mountable and has auxiliary input socket. Looks good, although it has a plastic frame, but lightweight. Not easy to programme to wake up to the CD but did it. Small and compact and fits nicely in the bedroom. For the price it’s worth it and looks more expensive than it is. Clear sound. I like it very much. If you want a micro CD system that looks and sounds good, I would recommend if you’re not fussy that it is plastic! Happy I bought it. Xmas present, but seems very good for money. Looks and sounds great in my bedroom. Easy to use and has good sound quality. Great value for money and fast delivery. Gave it as a gift. My girlfriend was very happy with it. Neat micro system fitting on my desk. Price wanted to pay, but disappointed with the quality of sound. We took it out of the box and tested its CD function. It worked and the sound quality was OK considering the price. However, we took it up to my daughter’s room and by then it had stopped working altogether. It turned on and would switch functions, but no function produced any sound! We returned it the next day. Looks great. Easy to set up and use. Sounds clear. My wife wanted a player for use in the kitchen whilst she is cooking, ironing, etc. I would love to have bought her a Sonos but couldn’t justify one of those being installed there (imagine that playing whilst the cooker fans, washing machine and dishwasher are all running!). So I thought this at less than £40 all in would fit the bill. And it certainly does, she is really pleased with it. Whilst it’s not the sort of sound system I would want in the lounge, to sit back and fully appreciate ‘the sound quality of my music’ it is prefect for what it was bought, i.e. a ‘background music’ player. So, it’s great for just that; and she will love playing her Christmas music on it whilst preparing all of the Christmas goodies for us all :-). Regarding the purchase and delivery; excellent service all round and, although about twice the price of a Royal Mail 2nd class delivery, delivery via DPD was brilliant, next day and they even told me first thing in the morning the actual time of delivery, the name of the delivery person, where my package was in his delivery queue, and his progress (parcel by parcel) in delivering to me. 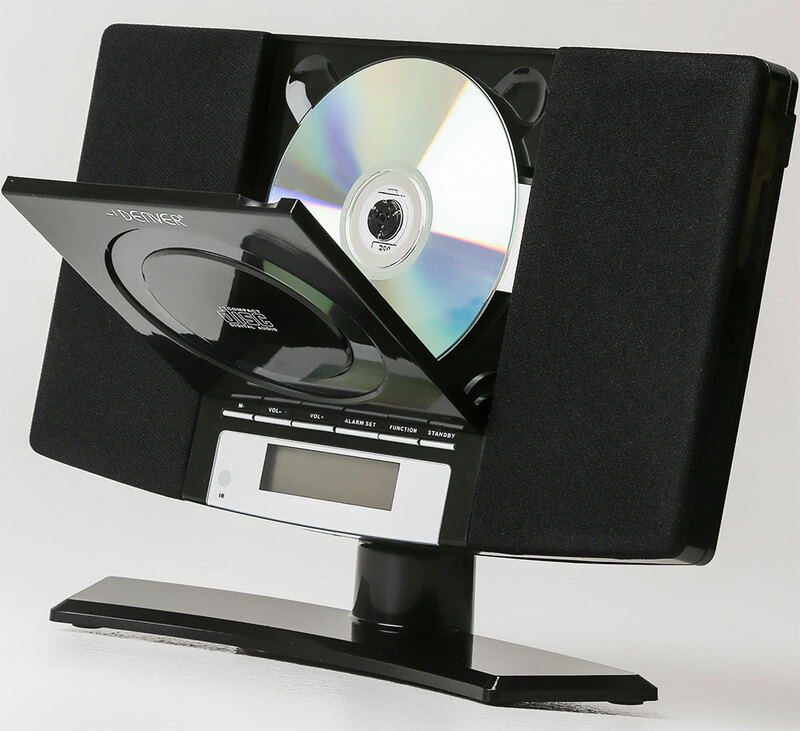 This CD system is very good value for money. 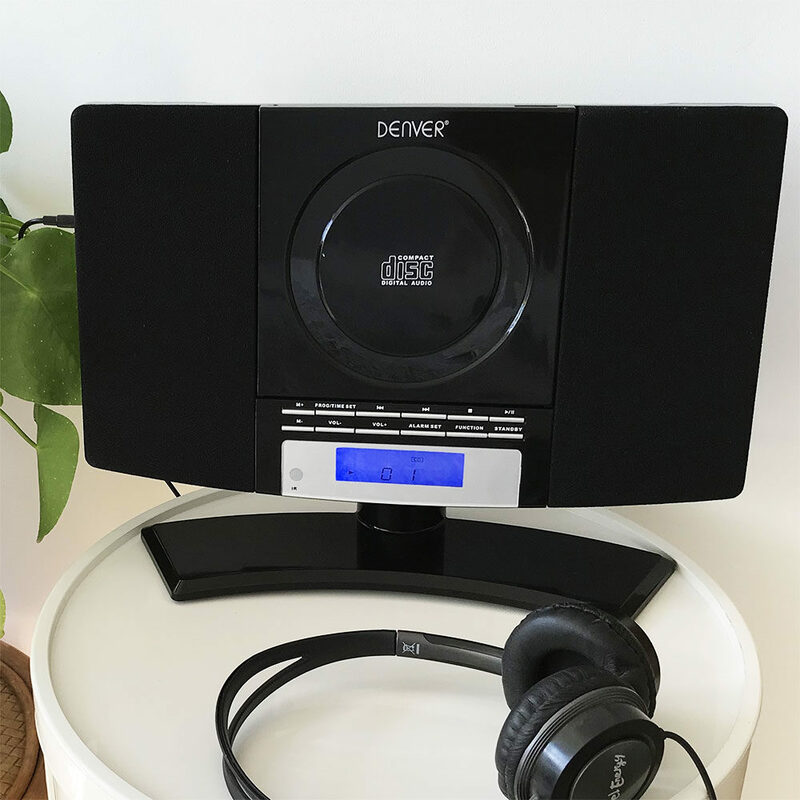 As you might expect from the price it does not appear to be strongly made, but it works well and provides sound from CDs of a very reasonable quality. Radio reception will vary depending where it is in your house and how strong station signals are. It is not the most sensitive from this point of view, but for the price is quite acceptable. 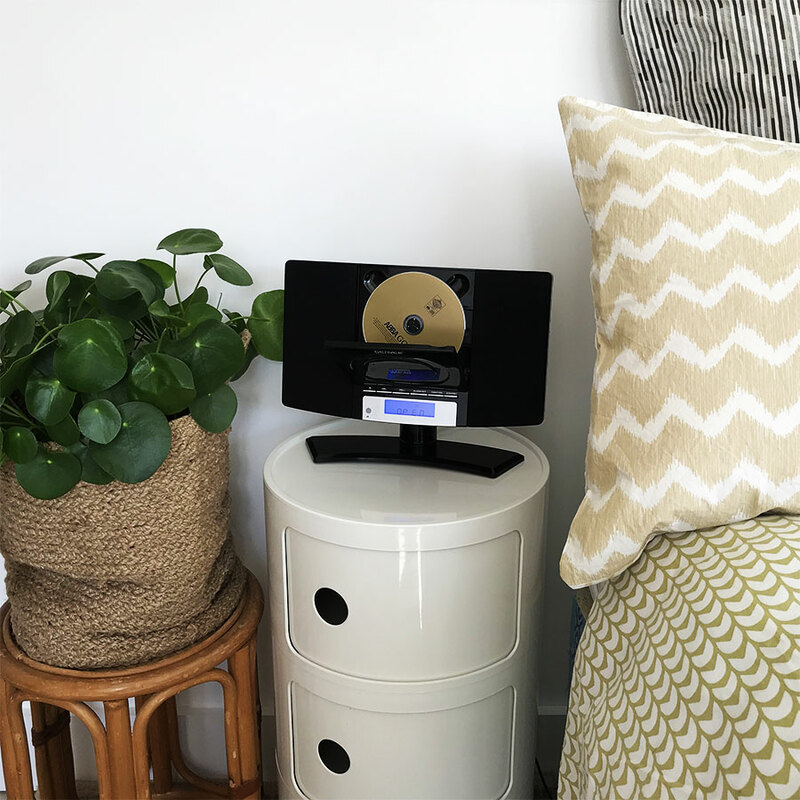 The alarm works well with loud beeps, radio or CD with two different times that can be set and with the usual snooze function. The remote control makes using it easy as pressing buttons on the machine itself can cause the unit to wobble on its stand. 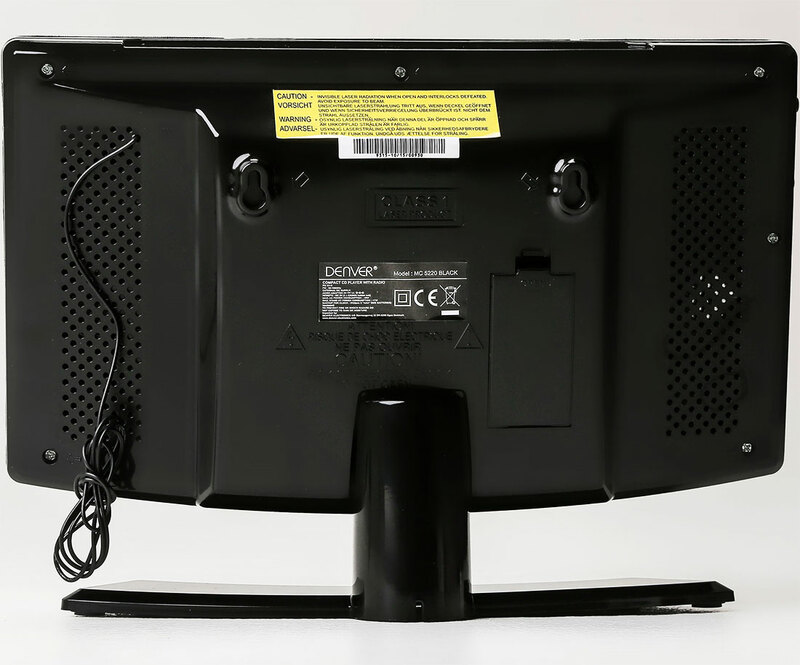 The instruction booklet is not necessarily easy to follow as the layouts of the machine and the remote do not correspond exactly to those described in the booklet though it is not too difficult to work out what is actually meant. We have not had it long enough to assess its durability, but it seems excellent value for money compared with similar units. Very quick service and happy with the product. While the buttons on the front are a little stiff and can feel like you are going to break the product the little remote control more than makes up for that draw back. The sound and overall look of the product is first rate. The ordering and delivery was excellent and I would definitely order from here again. This is a great piece of equipment for the price. Would recommend. Works ok instructions could be better and the remotes not working. It’s absolutely fine. It’s a bit fragile and flimsy, but what can you expect from the price? But the reception on the radio is absolutely fine and the CD works a treat. Nothing to complain about. And it’s really very cute (sorry for the girly finish). 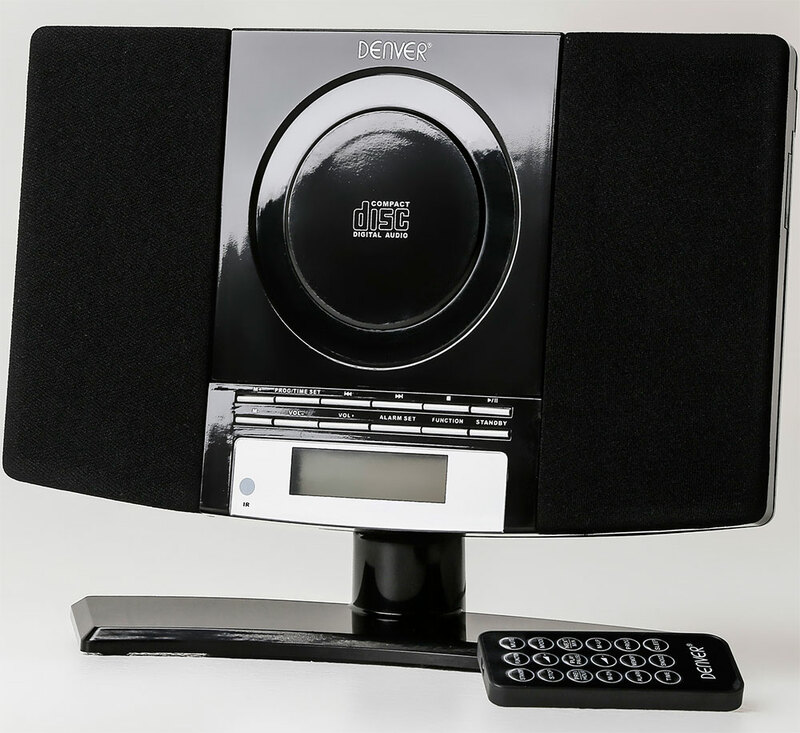 Excelent product, sounds great and is a nice size and is wall mountable. 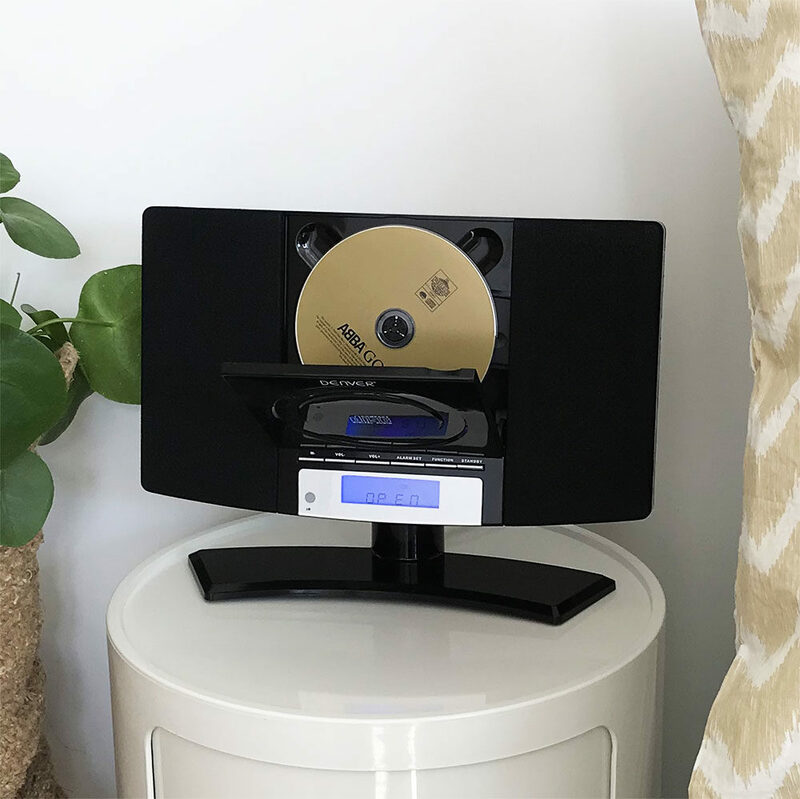 This cd system is nice and small and compact, can be wall mounted or left on stand the sound is excellent and the alarm system is great, I would recommend this to everyone. Very good item … Only problem if you switch off by accident at the mains you loose all the preset channels. Really pleased with this little CD player. Quality of sound is really good which wasn’t a great issue as I just wanted something small to put near my desk when working at home ! The added bonus is it can be wall mounted so more desk room! Ideal for the purpose of fixing to the wall in the kitchen and not a bad sound for the price. This would have been a lovely bedroom item for my 8-year-old, was pleased with the sound quality of the radio when tested but sadly the CD drive would not work. My wife has been looking for a decent CD player for the kitchen for ages. We have bought a series of players by Roberts, Pure etc, all of which have had to be returned as unreliable. This unit – at less than half the price of the others, seems just the job! Plus very swift delivery process, with time slot delivery. Fingers crossed, so far excellent! Thank you – arrived on time with instructions and adapted plug. Look and sound quality excellent. Excellent item, really nice sound, sturdy design really pleased with this product for both ease of use and value for money. Bought this system for my sons birthday, he loves it!. I may consider buying one for myself. Very nice and easy to use, very good sound, really pleased with this product as is easy to set up. Denver MC-5220 CD system arrived promptly after ordering. Great customer service when I emailed with a query. Not tried CD player yet as it’s a Christmas present from my mum. great looking product well packaged and arrived when stated .the system was a present for my wife who thinks its great ,i think it could have done with having a bit more bass, but other than that ,a very neat and nice item. would definately buy another if required. This is just what we wanted for our kitchen. Nice and compact with a great sound. Excellent value for money. Bought for Christmas for my wife. CD player packed up early February, very disappointed. You take a chance when the price is so low. Lovely player. Stylish. Good sound. Only negative is there isnt enough volume. 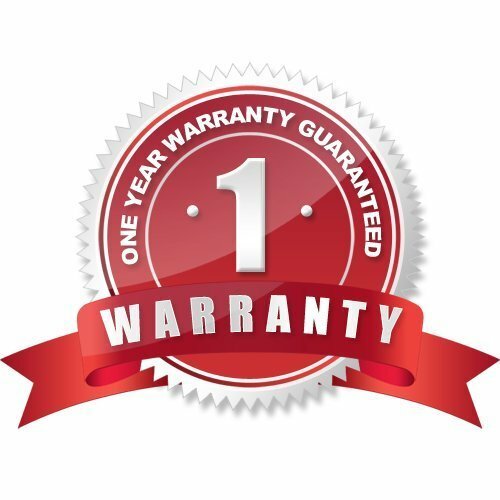 No problems with seller. Good, fast service. Would use again. Quick, efficient service. Good product. Love my wall mounted radio n CD player..it’s so small amd compact with a good reception.. at the price I just love it! Perfectly good piece of kit. easy to store radio stations and use. Good sound quality as well. For such a small product it has magnificent sound. Sits easily on wall above my bedside table and remote operates it easily, changing tracks etc. Can’t recommend it enought. Works well as described sound is reasonable but the volume control has to be near the top most of the time. 3WMs quick and efficient at sorting a problem I had. Good value for the money, easy to use and can be set up on the stand. love the design great value for mone , delivered in good time very happy with my purchase. After trying this item twice and not getting it to work the third one is fine. Everyone was very helpful and did everything they could to put matters right so I have no complaints about the service. Think I was just unlucky with the first two items. The items were delivered very quickly as well. Thanks everyone! Exceptional value and quality. would recommend this product. I bought this as a replacement for my daughter’s 6th birthday. It is easy to set the time and alarm function. She was very impressed when her CD came on at 7am. The music sound quality is just right and it looks stylish on her desk. I have tuned radio stations in and the memory works a treat. In all it’s a great system. The Player it’s very intuitive and simple to use. My only note is about the sound volume as it’s not that loud and if the room is already noisy then you can’t hear it clearly. Remote control has a good range and for that price I would recommend it as a background music player.